Genzo Takebe and his wife rescued Kan Shusai, the son of Kan Shojo, from Shihei Fujiwara and opened a small private school while living in obscurity in a village far from Kyoto (capital at that time) to hide Kan Shusai. However, Genzo was suddenly called out by the village headman, who gave him the following order: “If you are hiding Kan Shusai, bring us his head immediately.” At the same time, an unknown woman with a child visited Genzo’s house while Genzo was absent, asking them to train her child, Kotaro. She then left the child at Genzo’s house and went away. Genzo returned home deep in thought about the order. When he saw Kotaro, the newcomer to the school, he immediately decided to use Kotaro as a sacrifice in place of Kan Shusai. Genzo felt sorry for Kotaro since he had just joined the school that day. However, since Kotaro’s elegant face looked like Kan Shusai, Genzo consulted with his wife Tonami as to whether they should ask Kotaro to give up his life. Then it was time for examination of the severed head. Matsuomaru and Genba checked the faces of the students one by one at the school gate and then let them go home. They told Genzo: “Bring us the head of Kan Shusai.” Genzo was full of regret but cut off Kotaro’s head and submitted it to Matsuomaru. In fact, Kotaro was the son of Matsuomaru and his wife, Chiyo, and had been brought to Genzo’s house to serve as a sacrifice in place of Kan Shusai because Matsuomaru and his wife wanted to repay Kan Shojo for his kindness. Matsuomaru and his wife, Chiyo, despite their tears, were pleased that they were able to be a help of Kan Shusai and joined in the funeral of Kotaro, their son. The best student of Shusai Kan (Michizane Sugawara) who is a politician and also a great calligrapher. Genzo opens a small private school. One of triplets. He is the only one of the triplets who served Shihei Fujiwara, an enemy of Shojo Kan, causing him to become isolated. A newcomer to Genzo’s school. Son of Matsuomaru. On the day he joined the school, he was killed as a sacrifice in place of Shusai Kan.
A subordinate samurai of Shihei Fujiwara. Only son of Shojo Kan. He is hidden at Genzo’s private school. Concubine of Shojo Kano. 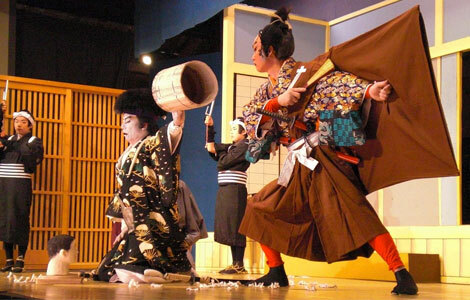 Mother of Shusai Kan.
A student at Genzo’s school and comic relief in the play.